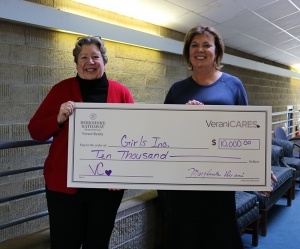 Girls Incorporated of New Hampshire is one step closer to a new look for their Nashua building thanks to VeraniCARES. Margherita Verani, CEO of Berkshire Hathaway HomeServices Verani Realty, stopped by to meet with Cathy Duffy, CEO of Girls Inc. and deliver a $10,000 donation. Girls Inc. of NH supports girls in achieving their goals through positive experiences in leadership development. They provide a wide range of enrichment, sports and leadership programs as well as after school and summer vacation programs in Nashua, Manchester and Concord. Staff provide counseling and support for girls to grow their confidence and succeed. VeraniCARES is a company-wide philanthropic initiative of Verani Realty that focuses on giving back to the communities we serve through Agent, Employee and company matched donations. Click here to learn more.